Click here for bagged and un-bagged cultivation. 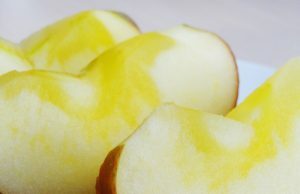 In the US, watercore is considered to be a disorder of apples. 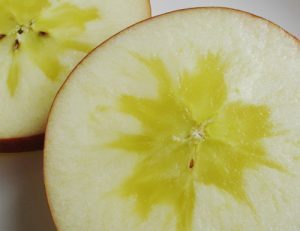 Watercore appears as yellowish glassiness of the fruit flesh around the core of the apple. It is called “Mitsu” or honey in Japanese because it resembles the color of honey. These apples are popular for their exquisite taste. They are valued as delicious apples and widely accepted in Japan. Watercore itself is a sign of good maturity and the fruit has more sugar than most apples of the same variety, although watercore itself doesn’t taste any sweeter. It is a natural response of apples to adverse environmental conditions. The growers are capable of controlling the harvest time to provide apples excellent in taste. Since they are fully matured, the fruit will deteriorate in storage and lose freshness easily. Despite the fact that the fruit has to be picked before full maturity to keep freshness and for long term preservation, the growers here would like people around the world to taste these flavorful Aomori Apples. The producers are skilled in determining the optimum harvest time to provide freshness, while they wait for the fruit to be fully mature. The apples we deliver to the world represent the idea that we offer good quality fruit as fresh as possible. We hope you enjoy our apples. In case you plan to travel in Japan, we recommend that you visit us in mid-November to December. Then we could serve you excellent, flavorful and delicious apples. It is so special to taste these premium apples in the apple-country.